This weekend is Canadian Thanksgiving and I feel that is necessary to be giving thanks not only for the food we are so fortunate to receive, but also to the thousands of dedicated farmers that make it possible for us to eat everyday. This is my favorite time of year in Ontario because we finally get to eat all of the delicious food that has been growing along the sides of country roads we drove along all summer. I am always amazed at the variety of produce that pops up in our markets and how delicious it is! Eating locally is possible no matter where you live in the world. Of course, every place has a different climate and growing season, so it does take a little work to find out exactly what is in season at what time of year and where we can get it. Taking advantage of local food is important for several reasons: one, it supports local industry and keeps our money circulating in our own country. Two, eating local food reduces the amount of fossil fuels required to transport the food from farm to table, making it a more sustainable choice. And three, food that is fresh maintains more of its nutrients. An apple grown in California (even an organic one!) 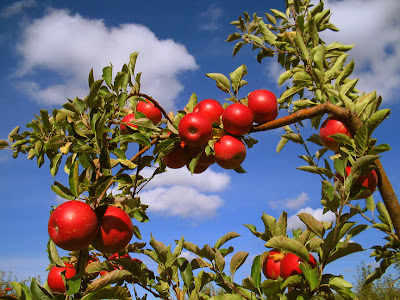 has less nutritional value by the time it reaches us, than an apple conventionally grown here in Ontario. Since I live in a big city, my favorite pastime is driving out into the country and finding the best roadside stands with the friendliest farmers. 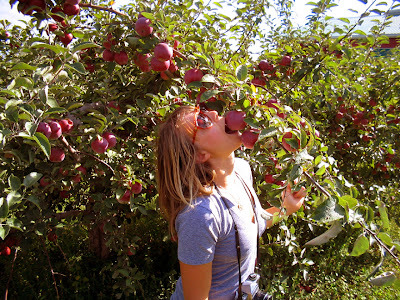 My friends and I went to an apple orchard the other day to pick some tart and crispy treats. It is a great opportunity to learn where our food is coming from and how it’s grown. This recipe for Apple Cider Cabbage uses food that is in season right now. It’s bursting with flavour and would be a great addition to your thanksgiving feast. It can be served over a grain, like brown rice or quinoa. 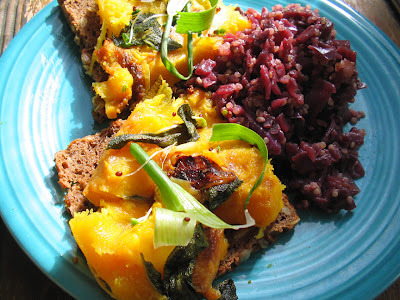 Serve with other heart-warming delights (pictured above is roasted acorn squash and garlic on rye sourdough toasts with green onions and broccoli sprouts). Heat oil in a large pot, add onions and cook for 5 minutes. Stir in all spices until the scent fills the room. Add chopped cabbage and apple and cook until the cabbage begins to wilt. Add 1 cup apple cider and vinegar. This should cook on very low heat for about 2 hours (the longer, the better as the flavours deepen). Keep adding the cider as it gets absorbed – don’t let the mixture get too dry! Add honey right at the end. Share with loved ones. Made this about a week ago. Delicious! Served it with acorn squash like you suggested. Perfect, hearty meal for the now chilly weather. In reply to Oma. What you can do is give your fruits and veggies a good scrub. You could also use a vegetable wash (try and get organic) to remove the pesticides/other chemicals. As long as you give them a good cleaning, you should be okay. However, I assume you have already tied to do this; tell them how silly they sound. Peeling the vegetables and fruits because of chemicals, when the simpler solution would be to just buy organic. Hello! I had a general question about cooking with fruits and vegetables. Currently I live in a situation where I don’t buy the produce I eat and it is definitely not organic, though generally local. I always have this disagreement with the people I live with – they believe it is better to skin all vegetables to decrease contact with pesticides (which would be conveniently solved by not buying pesticide-ridden foods in the first place) and I hesitate with peeling because 1. the flavour and colour is better with the skin on 2. I was always taught that most of the good stuff lives in the skin of our fruits and veggies. The compromise I make is skinning half the produce in question, but I am interested to know in this case what you think is more important: potentially removing nutritional value to avoid some contact with pesticides or leaving the sprayed skin (washing) and still getting the nutrients? Thanks a ton! hi! I tried the recipe and just wanted to share my results: I made it with only half the spices listed (was missing a few from my pantry…) AND helped myself to a serving after only half an hour, and it was still so good! I cooked the rest for the full 2 hours, and it was even better.Such a lovely rich flavour, just the cabbage itself has such a great taste when cooked! I can hardly wait for the next recipe!